The information & links below are to register as an attendee for the conference. If you would like to sponsor or exhibit, please go to the "Sponsors" page. Pre-registration will close October 5th at noon, day-of registration available until capacity is reached. We will do our best to accommodate day-of registration, however, we strongly encourage all to pre-register. We can not guarantee admission to day-of registrants. Day-of registration for all attendees is $55. Please note, schedule and presenters are subject to change prior to or conference day if necessary. *** Continuing Education table open at close of conference to receive certificates from the day. Please plan accordingly. It is estimated that more than two million arrests in the United States each year involve people with Serious Mental Illnesses (SMI) – half of which are homeless at the time of their arrest. As a result, untrained and unprepared stakeholders in the criminal justice system have been forced to navigate an increasingly scarce system of care for people with mental illnesses. Jails have become places where a disproportionate number of people with SMI spend significant amounts of time; their ties to the community severed, their treatment needs unmet, and their illnesses made worse. Judge Leifman will discuss his journey into the mental health system, the legal and medical history that led to America’s mental health crisis and the essential elements necessary to create an effective system of care that ultimately will transform the mental health and criminal justice systems and make jail the last option for people with serious mental illnesses, not the first. The Criminal Justice System was never intended to be the de facto mental health system in America. Structural changes are required in the community to develop a system of care where jails become the last resort for people with serious mental illnesses. Judge Leifman will discuss different approaches necessary to bring about change and how best to develop an effective system of care. Knowledge from neuroscience is helping us to understand mental illness in a brain-based way that has many implications for mental health treatment. Dr. Baylin has been working on the development of a brain- based model of treatment for the past 20 years, teaching about "Putting the Brain in Treatment" to mental health professionals nationally and internationally. He is the coauthor of two books that integrate neuroscience and treatment: Brain- based Parenting and The Neurobiology of Attachment-focused Therapy, both published by Norton as part of the Norton Series on Interpersonal Neurobiology. In this presentation, Dr. Baylin will give an overview of a brain-based approach to understanding and treating mental illness. In particular, he will discuss the expanding research on how genes and experience interact to affect brain development and mental health. Thriving religious communities can have dedicated and focused members capable of tremendous avocational contributions to the congregation as well as the outside geographical community. This is the story of how such a congregation were joined together through pastoral leadership and basic design thinking exercises to envision a perfect ideal for a church that included a wellness center. The volunteer convener of that strategy effort, Van Shea Sedita, helped ideate and focus the group of volunteers to understand and implement the basic foundation and early programs at Red Clay Creek Presbyterian Church in Wilmington Delaware. This presentation will not only focus on the story, but present helpful steps if you or your organization would like to follow a similar path establishing a wellness center. On a daily basis, as a designer and person in the world, Van focuses on helping people change for the better. That help may be in the form of research, interface design, education or community volunteer efforts. Van hopes that this talk holds practical advice and moving testimony of how a wellness center can help transform your organization or community for the better. Advocacy efforts are an important factor in helping to shape public policy however navigating the process can be intimidating. Having a basic understanding of the legislative process will help you become a more effective advocate. Learn about what legislative advocacy means and the ways that you can make a difference for the causes you believe in. De-escalation training can be challenging for law enforcement and misunderstood by both the public and police. This seminar will give the participants an inside view of how the Delaware State Police approached this topic and conducted their “Integrated De-escalation” Training. Participants will learn what Integrated De-escalation is; the four different phases of training; the four components of integrated de-escalation; successful strategies to teach law enforcement and more. This seminar emphasizes the how and why of the components of training in association to specific de-escalation strategies rather than de-escalation techniques alone. HIPAA (the federal health privacy rule) is both misunderstood and the subject of heated debate. Using vignettes for purposes of discussion, this workshop will provide an overview of HIPAA, with specific focus on identifying gaps between what the rule says and how it is frequently misinterpreted. Suggestions will be provided for achieving a balance between protecting individual privacy and permitting sharing of limited information to enhance quality of care and caregiving. Whether you are a family caregiver or a professional working with young people, you understand the challenges that may arise when it comes to communication with youth. Often, the question “how are you?” results in nothing more than “fine”. There may be times, though, when one word answers are simply not enough. In this session, we will cover communication techniques to help establish and enhance rapport, building a connected foundation with youth so that in the event more difficult conversations are needed, the approach becomes less daunting. From every day chit chat to an emerging mental health crisis, we will discuss ways you can develop conversations with youth beyond the one word responses and get to know how they are really feeling, and more so, how you can help. Also covered in this session will be ways to approach conversations with middle and high school age youth through social and emotional learning presentations from NAMI and Sandy Hook Promise. This workshop will define relapse syndrome and the direction of relapse prevention therapy according to Terrence Gorski. It will introduce the process of how relapse occurs for people recovering from addictive disorder, what drives patterns of self-sabotage and self-harm, and what takes an individual from a stable place in recovery to their first addictive use of a substance. This workshop will also identify common warning signs and triggers related to relapse syndrome, and assist with teaching the development of relapse prevention skills to help people intervene on the relapse process prior to the high risk point. Theories about relapse and relapse prevention therapy according to Gorski will be discussed and resources to practice the others will be explored. The presentation will include an overview of the Specialty Courts including the Mental Health Court, the Veterans Court, and other Problem-solving Courts. Each overview will provide information on how these Courts function, how/if they intersect, the referral process, accessibility, and the Court’s role in the mental health system as a whole. In addition, this presentation will offer a general overview of the Civil Commitment process. Lastly, resources, such as important phone numbers, will be provided. Is dementia a mental health condition? I will discuss dementia’s very common and often disturbing behavioral features – what they are, how to manage them, and whether they can be treated as a mental health condition. Audience participation will be encouraged through a pre-talk and post-talk brief quiz and open discussion. This presentation will clarify the association between violence and mental illness by reviewing data that show that risk of committing violent actions is associated with behavioral factors as opposed to psychiatric diagnoses. We will discuss the false perception that violence is highly related to mental illness and how this further stigmatizes individuals who are often already marginalized. It can be overwhelming to think about what to do and how to get access to help when a child you know or love is in crisis. Learn to recognize, manage and plan for a child’s mental health crisis. This panel discussion will identify various crisis resource options for children, when they are appropriate, and how to access them. There will be opportunities to submit questions for the panel participants. In times of crisis, those in crisis, their loved ones, clinicians and community members may not know where to turn. What happens when 911 is called? Should I go to the Emergency Room? What resources come to me? This panel discussion will identify various crisis resource options, when they are appropriate, and how to access them. There will be opportunities to submit questions for the panel participants. In this workshop, parents and caregivers will be provided with helpful information around what can and cannot be changed as it relates to behavior in children with particular focus given to skills parents can use to increase compliance and increase successful behavior across situations. This presentation explores the connection between childhood trauma and substance use. The concept of addiction as a ‘family disease’ will be explored and discussed. Prevention of substance use disorders through the use of family interventions such as structural family therapy will be considered. Presenter: Cathy Devaney McKay, MC, CAADC, LAMFT, President & CEO, Connections Community Support Programs, Inc. This seminar focuses on highlighting the prevalence of suicide in law enforcement, signs and signals of a potentially suicidal officer, strategies for intervening and resources for agencies to raise awareness for their officers. It encourages officers to “roll back-up” when colleagues are in crisis and provides information to dispel the stigma associated with seeking help. For the last 30 years or so, Transcranial Magnetic Stimulation (TMS) has really existed only for study. It wasn’t until 2008 that the first FDA indication came about. To help inform clinicians regarding TMS Therapy, this presentation will provide education regarding, the mechanisms of action behind TMS, the risks and benefits of TMS, how to administer TMS, and future uses of TMS. In any given time or place, we may encounter someone experiencing a mental health crisis - whether it is in a familial or friendly relationship, in a professional setting, or out in the community. If you are not a trained mental health professional, how can you help? This presentation will address signs and symptoms of a mental health crisis, ways to keep yourself and the person in crisis safe, tools to de-escalate the individual in crisis, and what resources are available to help. When children we care for are in crisis, or experiencing strong emotions or behaviors that seem out of control, it can be difficult to know how to respond. The goal of this breakout session is to review strategies for caregivers to center themselves, assist in de-escalating a child or adolescent and options for engaging other people and professionals to keep all those involved safe and supported. An increased and complex understanding of the needs of students of color is necessary but often lacking in our field. This presentation will provide an overview of the mental health concerns that students of color may experience while managing their academic obligations. We will consider the intersecting nature of their social identities and the impact of systems of oppression on their mental health. Considering our work with these students from a strengths based approach, we will provide examples and suggestions for how to actively create healing spaces and encourage best practices. Continuation from Part 1 in breakout session 3 - it is strongly encouraged to attend both sessions! Approved Continuing Education (CE) credits for individual presentations are noted on the 'Presentation' page as they are confirmed. Please note that not all presentations are approved for the same credits from each provider. Review carefully what presentation will apply for CE's for your profession before selecting what to attend. The Inspiring Hope Conference is sponsored by the Delaware Psychological Association. 5 credits will be offered upon completion of this program. The Delaware Psychological Association is approved by the American Psychological Association to sponsor continuing education for psychologists. The Delaware Psychological Association maintains responsibility for this program and its contents. A note to Nurses - due to unforeseen circumstances, we are unable to provide continuing education for nursing this year. We apologize for any inconvenience! 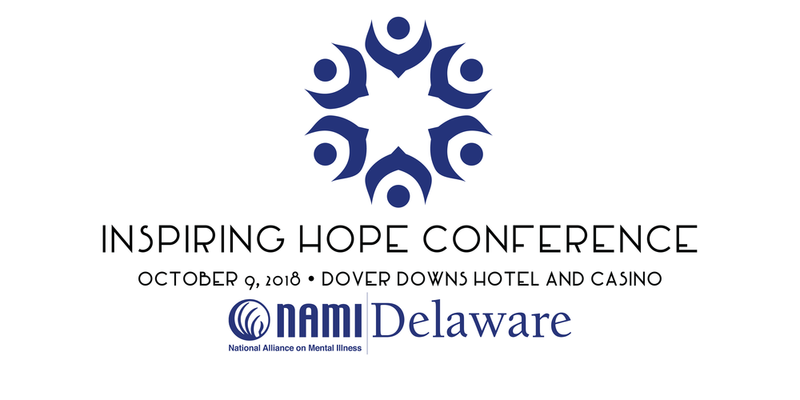 The National Alliance on Mental Illness in Delaware program, "NAMI Delaware Inspiring Hope Conference 2018", scheduled for Oct 09, 2018 in Dover Downs Hotel & Casino, has been approved for 5.00 credit(s), including 0.00 Enhanced Ethics credits. The course ID number for this program is NAM10092018NAMI_. Local Kent County Dart Bus (Route 109) can drop you off at Dover Downs Hotel & Casino. Please refer to http://dartfirststate.com/ for more details.